Have you been thinking of going on a camping trip? 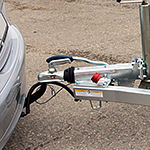 With towing campers, you have to be careful to not damage your vehicle due to the weight of the camper. This really applies more to larger campers, but even with smaller campers, you have to check that the towing capacity matches the camper size. You can find this rating in the owner's manual. Cars and trucks have a Gross Combination Weight Rating, which includes the weight of the vehicle and the camper together. You'll need to figure out if this rating matches the capacity in the owner's manual. In addition, you want to make sure that the camper doesn't have more luggage or items placed inside that would alter the maximum weight. As you put more weight into the camper, the more strain will occur to your car's engine. If you want help picking out the right hitch package, you can look to the service center at Lithia Subaru of Great Falls for more information.